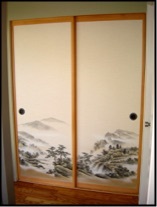 Japanese Fusuma are opaque sliding panels, typically used as closet doors or room dividers. 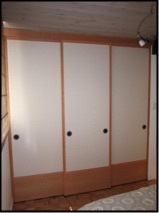 They can also be used as pocket doors, cabinet doors, and hinged standing screens. Fusuma not only block light, they also help muffle sound. Furthermore, because of the color, design, and texture of different papers, Fusuma easily become a complimentary design element in the home or office. 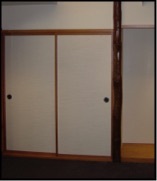 Fusuma panels can work very well in the Mid-century modern home. 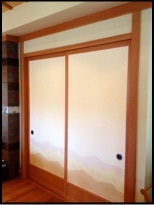 The Fusuma papers come from Japan and reflect both contemporary and traditional Asian art motifs. Sample books can be seen at the shop. 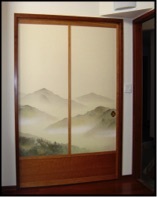 The light-weight frame which surrounds the Fusuma paper can be made with any of the woods that Pacific Shoji Works offers, and is finished by hand with clear oil and wax. 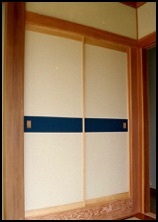 All panels include Japanese hikite – traditional Fusuma finger pulls.